The Noirgroni is a terrible portmanteau and an enjoyable cocktail. It was a combination of Old Overholt rye, Carpano Bianco, and a gentian liqueur called Avèze (like the spirit, the website is French). The whole is then topped with orange bitters and served how you like. 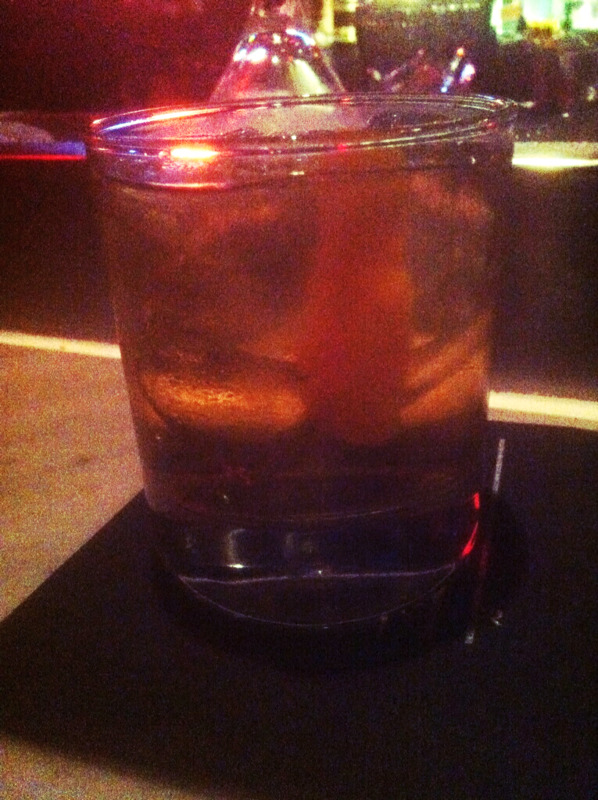 If you ask either myself or the bartender, you should like it on the rocks. I recall the some mention of artichoke, but I didn't see any Cynar go into the cocktail and the Avèze people have enough love for gentian that I doubt they'd pollute it with another plant. I might simply be mistaken - certainly, the absence of artichoke liqueur would go a long way toward explaining why I liked this drink. Light, strangely vegetal, and so refreshing I could have kissed it. (I settled for drinking it.) Those who are intimately familiar with Noir's menu may see similarities to their Dark Horse cocktail; those who are not might call it a spin on the Boulevardier, the Negroni's whiskey-based cousin. Saying it's a Negroni variant is a bit of a stretch. The two cocktails have no ingredients in common, unless we count two rather different kinds of vermouth as the same. The only flavor they both hit is the orange nose. Everything else is completely dissimilar. This is the peculiar pitfall of Negroni Week. How do you strike a balance between innovation, which any bar participating in this promotion is likely to be known for, at least locally; and keeping the drink, somehow, recognizably a Negroni? Under-innovate, and you've disappointed your customers. Over-innovate, and you've accomplished the High Mixology version of an Appletini: a drink that bears no relation to its name. Add to that the fact that there are a thousand bars doing this at once, each trying to come up with something no one else has thought of, a clever variation on a drink we've spent a hundred years deliberately not messing with. Some of these will be brilliant. Some will fail spectacularly. Some of them will be delicious in their own right, but not true members of the Negroni family. Noir's entry is the last.